This 80-hour recording comes on six MP3 CDs. It can be used on any device that displays the MP3 symbol. You can transfer the audio files for your personal use onto your computer, smartphone, MP3 player, and other compatible devices. Ever since he became a Christian at the age of forty, it has been actor David Suchet's dream to make an audio recording of the whole Bible. 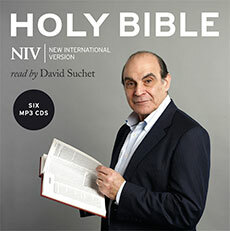 In between filming the final episodes of the British television series Agatha Christie’s Poirot, David Suchet spent over 200 hours in the recording studio to create the very first full-length audio version of the NIV Bible spoken by a single British actor. He has enjoyed great success with the Royal Shakespeare Company and in London's West End.